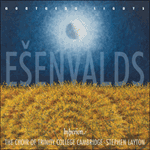 O salutaris hostia has quickly become one of Ešenvalds’ most popular pieces. Originally written for female voices, this version for full choir was first heard in 2009. It is a gentle meditation, completely diatonic, its dynamic level only once rising to mezzo forte. Over a hushed chorale for full choir, rich in added notes, curlicues of melody from two solo sopranos drift across the soundscape, alternately echoing and imitating each other or carolling together in thirds. The effect is quietly ecstatic, a brief moment of adoration and wonderment.